Court Appointed Special Advocates, a children support network, was looking for solutions to get their ongoing message out to the public. 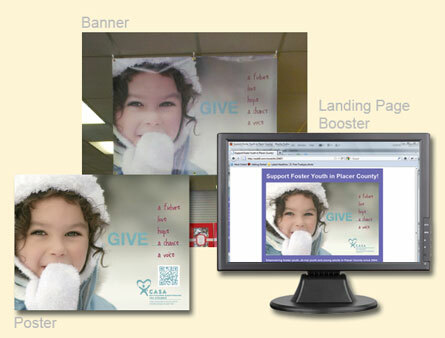 The campaign they used featured several different types of print media, including window posters and banners with QR codes, and mobile landing pages. Using an emotional graphic for the call-to-action, passersbys with mobile phones could connect with CASA via their landing page, view additional information, and redirect to Facebook or e-mail to a friend.